Increased productivity is something many of us strive for both at work and at home. By decluttering and organizing your physical space, you can help save time and increase productivity in your life. You will spend less time searching for items you know you own but cannot find. Procrastination will decrease when everything is organized because proper organization makes it easier to start a project. You will eliminate distractions. Living and working in an uncluttered space can make it easier for you to focus on a task. You will be able to put away your belongings more quickly, saving time and boosting productivity. By setting up an organized calendar and other planning tools, it will be easier for you to plan your day based on your priorities. With an organized kitchen, it will be faster to plan meals, put away groceries, find ingredients and cook. A decluttered bedroom is often more relaxing, allowing you to sleep better, which will result in improved productivity when you’re awake. Setting up an organized area for your sporting goods or exercise equipment, or a designated exercise area in your home, will promote regular physical activity, which can result in more energy throughout the day. Creating an uncluttered and organized system for incoming mail will boost efficiency when paying bills and responding to mail. Organized and decluttered bedroom closets and dressers will allow you to get dressed and ready more quickly each morning. Setting up an organized home office area will give you privacy and eliminate distractions, making it easier to get work done at home. An organized laundry routine will save you valuable time each week sorting, washing, folding and putting away clothing. Decluttered and organized bathrooms help to save time in your daily routine at the start and end of each day. A less cluttered home means there is less to clean and dust, drastically cutting the amount of time it takes you to clean your home. As you can see decluttering and organizing your home does a lot more than just make the space look tidy. 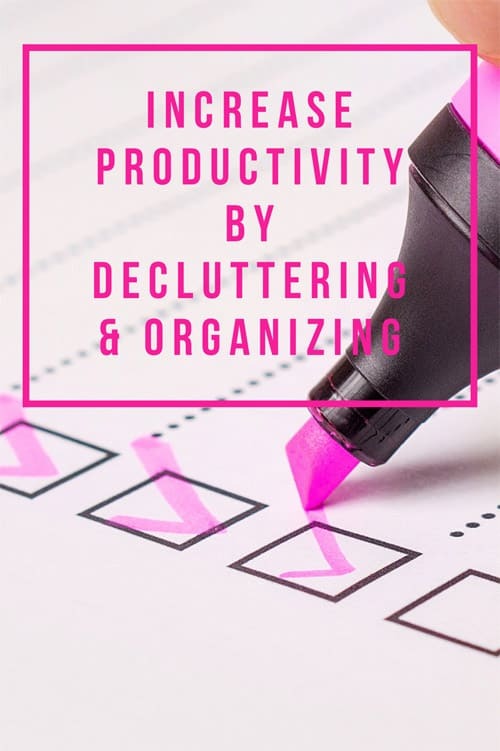 An organized home can save you valuable time in many aspects of your life, resulting in improved health, well-being and a boost in productivity. Please contact me if you’d like more information on how my services can help you to declutter, organize, and simplify your life. If you’re located in the Raleigh, North Carolina area, I offer my hands-on in-person professional organizing services in blocks of time of 3 hours or more. If you live outside the Raleigh area, I offer 1-hour sessions of virtual organizing assistance over video chat. OMG. This list is very comprehensive. I love it. I find being organized helps me get down to work immediately, as soon as I sit down at my desk. Thanks for commenting, Janet. I agree, being organized can help you focus and get down to work faster.